What’s the next best thing to having your own rescued pig, goat, sheep, cow, llama, or bird? Sponsoring one at MFS! By sponsoring an animal on a monthly or annual basis, you are making a regular commitment to helping animals. Your gift will be felt year-round as a source of food, shelter, veterinary care, and love. Your generosity also enables MFS to plan securely with the knowledge that your support will be there in the future. As we value all of our animals equally, all sponsorships cost the same. We ask that you make a full-year commitment to sponsoring an animal. You can sponsor your animal with a one-time gift of $250 or with a monthly gift of $25 given for one year. Choose an option below to learn more about animals available for sponsorship. When you sign up, you will receive an automatic email receipt confirming your gift. After that you will receive a welcome packet in the mail including an MFS magnet, welcome letter, photo and information about your sponsored animal, and two complimentary tickets to a public tour so you can meet your sponsored friend (the MFS tour season runs approximately mid-April through November). Hay, feed, and produce for our animals to eat. Shavings to provide soft, warm bedding for our animals. Vitamins and supplements to keep our animals healthy. Veterinary supplies and care for sick and injured animals. Upkeep of sanctuary buildings and property to ensure the animals have clean and comfortable place to call home. Absolutely! Animal sponsorships make great gifts. If you would like to sponsor an animal on behalf of someone else, please send an email after you make your gift to giving@maplefarmsanctuary.org with your name as well as the name and mailing address of your gift recipient. 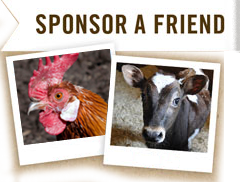 If you have questions about your sponsorship, please contact us at giving@maplefarmsanctuary.org.